Laura Trott and Katie Archibald won three gold medals to help Great Britain Cycling Team top the medal standings on an exceptional final day at the 2015 UEC European Track Championships in Grenchen. Trott successfully defended her omnium title in a dominant performance to collect her third gold medal at the Velodrome Suisse after success in the team pursuit and scratch race. The victory was the 23-year-old's tenth European title. Archibald, also part of the team pursuit squad, won the individual pursuit before returning to the track to triumph in the elimination race and like Trott seal a hat-trick of gold medals. Bronze for Ciara Horne in the individual pursuit confirmed an excellent championship for the women’s endurance squad. The remarkable final day saw Great Britain Cycling Team top the medal table with six gold medals and three bronze medals. "For me that's my tenth European title so I'm super happy with that,” Trott said. “It's just been great. I absolutely love the Euros. I did it from the very first one in 2010 and I've been a European champion in every one I've competed at, which I guess is quite lucky. So yeah I've really enjoyed this whole week of racing." Archibald said: “Pretty happy, pretty sweaty. All the things you’d expect. Leading the omnium after three events, Trott was second in the 500m time trial before winning the flying lap to open up a 34-point lead over Denmark’s Amalie Dideriksen. Trott then added 35 to her tally in the points race to secure victory by 36 points. Archibald qualified fastest in the individual pursuit with a time of 3:31.959 over 3000m to set up a final against France’s Elise Delzenne. And she defended her title with a commanding ride in 3:32.832, nearly five seconds faster than Delzene. Welshwoman Horne, another part of the winning team pursuit squad, overcame German Mieke Kroger by a second for bronze. 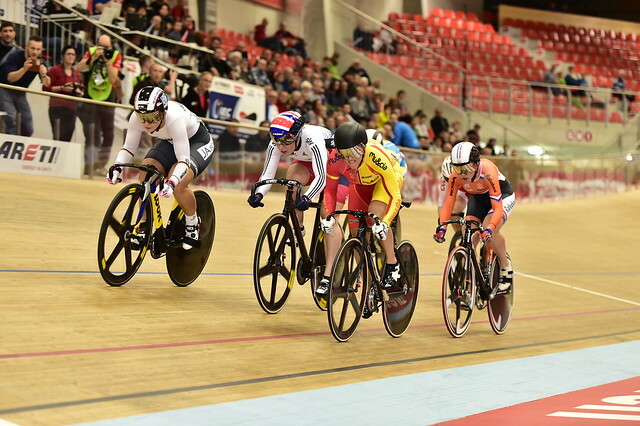 In the keirin, Jason Kenny and Katy Marchant both went out in the second round of the men’s and women’s events respectively. Matt Crampton exited in the first round repechage of the men’s event as Vicky Williamson crashed at the same stage of the women’s competition, fortunately suffering no serious injuries. Chris Latham and Ollie Wood finished in 12th in the Madison, collecting six points but losing two laps to winners Spain.